Cat's claw has been steadily growing in popularity since it was discovered in the Amazon, and it is currently used for a number of medicinal purposes, from healing common colds to relieve joint pain. The cat's claw vine is native to South America and grows mainly in tropical and subtropical areas of Bolivia and Peru, were Amazonian tribes have utilized it for millennia to treat serious and mild diseases alike. However, it wasn't until the 1970's that cat's claw was discovered by the Western world, and its medicinal actions still under investigation. Reducing inflammation. Cat's claw has been traditionally used to alleviate a number of inflammatory processes in the human body. Balancing the immune system. The plant contains bioactive substances that interact with the immune system, improving its functioning and shielding the body against harmful microorganisms. Treating dengue fever. Cat's claw immunoprotective effects may help fight this tropical disease, as well as other viral infections. Repairing skin damage. The cat's claw herb contains antioxidants that may help protect cell membranes from ultraviolet (UV) radiation, thus reducing the damage caused by sun exposure. Preventing degenerative diseases. The alkaloids contained in cat's claw bark are thought to be responsible for the herb's beneficial effect on memory impairment, which may help prevent the onset of dementia and Parkinson's disease. Eliminating bacteria. Cat's claw antimicrobial properties have been shown effective at inhibiting Staph infections in preliminary, in vitro studies. 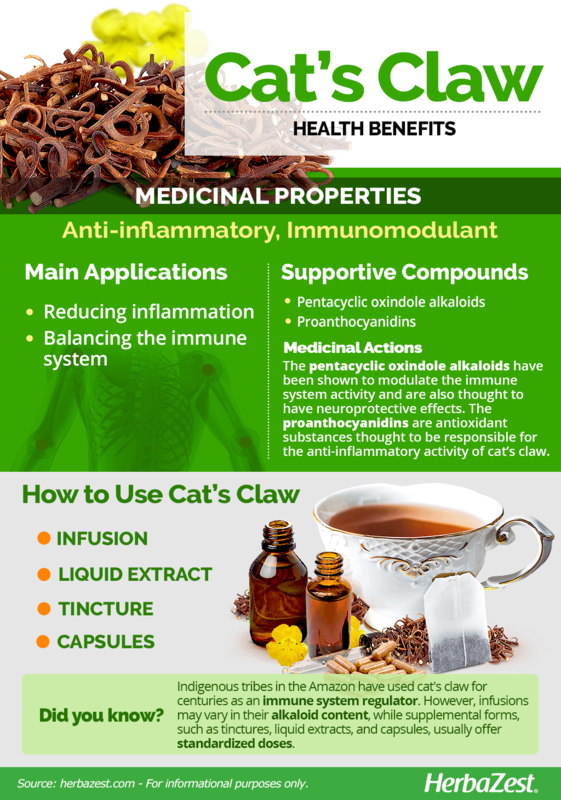 Recent research into the mechanisms behind cat's claw health benefits has revealed several potent phytocompounds, mainly pentacyclic oxindole alkaloids (POA), which affect the immune system activity and may also have neuroprotective effects. Cat's claw plant has been shown to contain proanthocyanidins, a class of antioxidant that is also thought to be related to its anti-inflammatory activity, as well as phenolic acids, mainly caffeic acid. Anti-inflammatory properties are also present in devil's claw, rose, and turmeric, whereas cherry, cabbage, and the tea plant have the ability to enhance and protect immunity. While cat's claw toxicity has not been extensively studied, it appears to have few side effects. Some people have reported nausea, dizziness, and diarrhea while taking cat's claw. These side effects go away in many people after their body gets used to the herb. Though cat's claw appears to be generally safe, moderation should be exercised, and women who are pregnant or breastfeeding should avoid it. People with chronic health conditions, such as autoimmune diseases, skin grafts, kidney or liver disease, tuberculosis, leukemia, or low blood pressure should refrain from taking this herb. Cat's claw bark may interact with some prescribed drugs, such as immunosuppressants, blood thinners, diuretics, and blood pressure medications. The growing interest in cat's claw health benefits reflects in the increasing variety of herbal preparations that have become available. Due to its bitter flavor, the uses of cat's claw are strictly medicinal. Infusion. Once it is dried, cat's claw bark can be brewed; however, because the phytonutrient content of the plant can vary depending on when it is harvested, infusions may vary in their alkaloid content. Tinctures and liquid extracts. 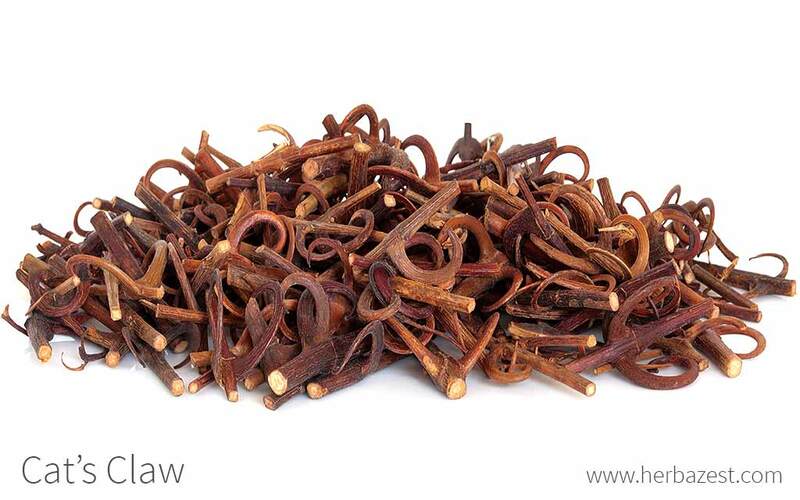 Alcohol- and water-based extracts of cat's claw are the preparations most widely used in scientific studies. These extracts are typically standardized to contain 3% alkaloids and 15% phenols. Capsules. Cat's claw capsules usually comes in practical, standardized doses; however the concentration of bioactive compounds may vary depending on the brand. Cat's claw bark can be difficult to find in temperate climates, though select specialized health stores may carry it as teabags. Online retailers, however, provide the best chance of encountering supplies to fit individual wants and needs. While dried cat's claw bark allows for a greater flexibility when it comes to homemade remedies, there is a significant risk of accidentally lowering the herb's potency by destroying some of its compounds during the preparation process. 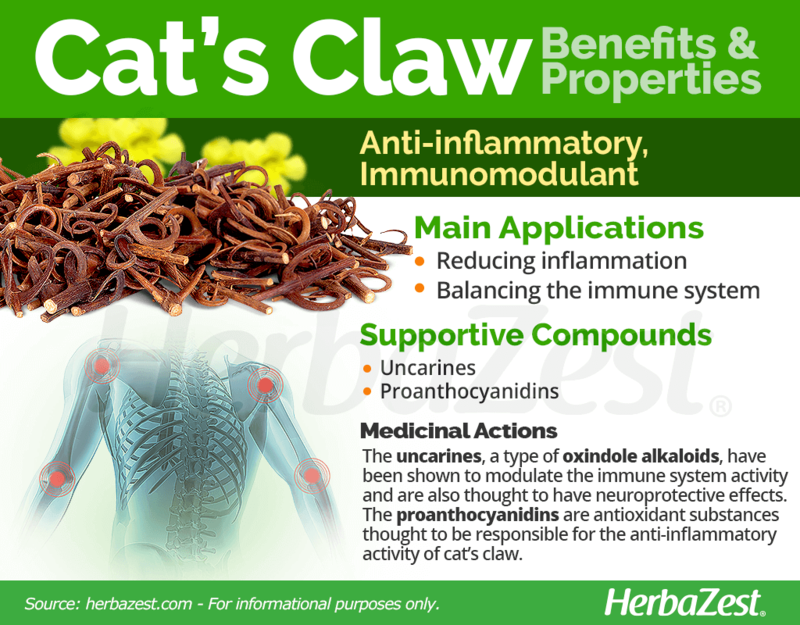 Herbal supplements that feature cat's claw are becoming more prevalent on today's market. These can often be found in capsule, tincture, and liquid extract forms in an increasing number of specialized herbal stores, as well as through many online retailers, which also provide valuable information about concentrations, dosages, and price points. Most supplements provide standardized cat's claw dosages, although it is important to look for a reputable and reliable company before making any purchase, as many do not observe the appropriate manufacturing standards. Which species to buy depends on the objective of medicinal use. For example, thanks to its unique alkaloids, Uncaria tomentosa is the cat's claw species with the most immune-enhancing properties, whereas Uncaria guianensis is more popular for anti-inflammatory purposes. The cat's claw vine (Uncaria tomentosa) is a woody perennial not frequently grown outside of its native environment, in the tropical and subtropical areas of Peru and Bolivia. In order to increase the chances of growing cat's claw successfully, some conditions are necessary. Heavy precipitation, ranging from 60 - 160 inches (1,500 - 4,000 mm) each year, also plays a vital role in the development of cat's claw. Soil drainage is not an issue, as the plant can withstand several days of flood conditions, but a nutrient rich area is recommended. The cat's claw plant prefers the acidic soils that are typical of its tropical native region. The roots of Uncaria tomentosa are no longer harvested in order to protect the species from extinction; however, cat's claw bark is generally stripped from wild vines for export after three years of growth. Like with all other creeping vines, growing cat's claw should be done in association with trees to act like trainers; otherwise, artificial support should be used in order to train this plant. It is best to develop cat's claw cultivation as part of an agroforestry system - for example, associating it with timber - instead of attempting to force it in a conventional field. Cat's claw is a climbing vine that can grow up to 100 feet (30 m), with stems that feature sharply-hooked thorns and flowering stalks that act as tendrils. Cat's claw flowers can range in color from cream to bright yellow, and simple, grooved leaves grow in opposite pairs. Cat's claw (Uncaria tomentosa) is a member of Rubiaceae family, which comprises about 13,000 species, including coffee (Coffea arabica), cleavers (Galium aparine), and Noni (Morinda citrifolia). Since Uncaria tomentosa is traditionally not cultivated, but rather harvested in the wild, no subspecies, varieties, or cultivars have been identified or developed yet. The Uncaria genus covers 40 different species around the world, many of which are locally referred to as "cat's claw." Uncaria tomentosa shares its popularity with close relatives, namely Uncaria gambir and Uncaria guianensis, which are also used for cosmetic and medicinal purposes. 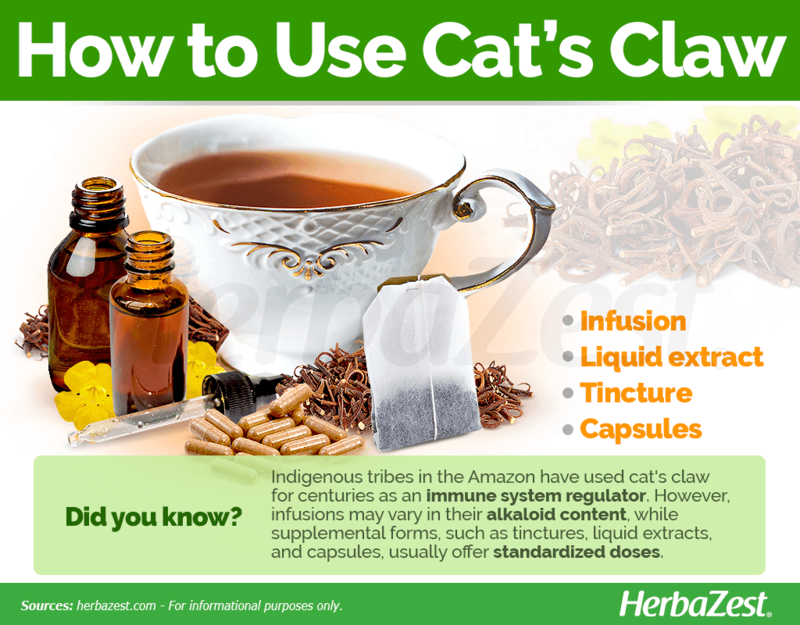 The Ashaninka and other indigenous Amazonian tribes have used cat's claw for centuries as an immune system regulator, as well as for treating serious and mild diseases alike. However, despite its natural prevalence, the herb was not discovered by the Western world until the 1970s, when ethnologist Klaus Keplinger documented its potential applications. His work over the following two decades led to a significant demand for cat's claw throughout Europe and, by the 1990s, the United States had also recognized its healing powers. The economic importance of cat's claw lies in its healing properties. Initially, cat's claw supplements were manufactured from the roots of Uncaria tomentosa. However, as the herb grew in popularity, government regulations in Peru - its top producing country - banned the direct harvest of cat's claw roots to prevent it from becoming an endangered species. Cat's claw bark has been shown to contain the same beneficial qualities the roots, and indirect harvest remains alive and well. In 2000, Peru exported almost 96 tons to the United States alone and generated $178,000 USD. Now, as resources become restricted, cat's claw prices have skyrocketed: in 2008, the powdered bark cost $9.50 USD per kilogram. Skin care. Cat's claw antioxidant, antimicrobial, and astringent properties have been linked to anti-aging effects. Extracts containing the alkaloids and phenolic acids of Uncaria species are used to produce skin care products, such as lotions and creams.